This blog post comprises a review of the 5th International Workshop on Quality of Multimedia Experience (QoMEX) 2013. This review is also published within the QUALINET Newsletter [PDF]. Multimedia has become pervasive in the last decade and is a ubiquitous part of modern life. Multimedia content is delivered to a wide variety of devices both fixed and mobile, the consumption environment can vary dramatically, and users increasingly demand fulfilling interaction with their media. Evaluation, both objective and subjective, of separate audio, video, or image content is well established, but there are substantial challenges in assessing users’ experiences of mixed content. This is exacerbated by the diversity of devices, interfaces, consumption environments, and content prevalent in today’s market. Increasingly, evaluation approaches must include psychological, perceptual, and contextual dimensions to truly represent and measure the users’ experiences. Understanding and modelling how users react to and perceive content and applications will inform and improve new applications and lead to better user experiences. QoMEX is the flagship scientific event of the COST Action IC1003 QUALINET. After San Diego (2009), Trondheim (2010), Mechelen (2011), and Yarra Valley (2012), QoMEX 2013 is being held in Klagenfurt am Wörthersee, Austria. With its modern facilities and pleasant surroundings, Klagenfurt provides an excellent venue for three days of interesting presentations, stimulating discussions, networking, and cooperation opportunities on recent research in quality of multimedia experience. QoMEX provides a forum for researchers, practitioners, teachers, and engineers to share their datasets/databases in the area of Quality of Experience. This effort has been started in 2012 and is successfully continued in 2013. The dataset will be hosted as part of the COST Action IC1003 QUALINET and in collaboration with the ACM Multimedia Systems dataset. "Kansei Engineering: How to design emotional experiences into products and services" by Simon Schütte, Linköping University, Sweden. The presentation is available here and the video is available also. "3D Video Processing, Perception, and Quality – A Content Creator’s Perspective" by Aljoša Smolić, Disney Research Zurich, Switzerland. "6 factors to consider in quality of media experience" by Peter Purgathofer, Vienna University of Technology, Austria. Finally, the QUALINET Industry Forum and Expo will hopefully stimulate interaction and strengthen the links between the workshop participants from academia and industry. It also includes an invited talk from Thomas Richter on "HDR Image Quality in the Evolution of JPEG XT". QoMEX is also known for providing excellent QoE in all social activities which allows for scientific discussions and beyond. In particular, QoMEX 2013 offered a welcome reception at the workshop venue and the workshop dinner at Werzer’s Hotel Resort in Pörtschach with a prior boat trip on the lovely lake Wörthersee. Abstract: The effects of using two-dimensional video projection together with parametric three-dimensional spatial audio reproduction system are examined in this study. The discrepancy between the auditory and visual events, and differing depth cues, are evaluated by means of subjective evaluations using the method of adjustment. The results show the Directional Audio Coding to be well suited for immersive audiovisual setups allowing a large area of viewing positions. Abstract: This paper undertakes a detailed comparative analysis of both PESQ and VISQOL model behaviour, when tested against speech samples modified through playout delay adjustments. The adjustments are typical (in extent and magnitude) to those introduced by VoIP jitter buffer algorithms. Furthermore, the analysis examines the impact of adjustment location as well as speaker factors on MOS scores predicted by both models and seeks to determine if both models are able to correctly predict the impact on quality perceived by the end user from earlier subjective tests. The earlier results showed speaker voice preference and potentially wideband experience dominating subjective tests more than playout delay adjustment duration or location. By design, PESQ and VISQOL do not qualify speaker voice difference reducing their correlation with the subjective tests. In addition, it was found that PESQ scores are impacted by playout delay adjustments and thus the impact of playout delay adjustments on a quality perceived by the end user is not well modelled. On the other hand, VISQOL model is better in predicting an impact of playout delay adjustments on a quality perceived by the user but there are still some discrepancies in the predicted scores. The reasons for those discrepancies are particularly analysed and discussed. As an organizer I’d like to thank you for attending QoMEX 2013 and I’d like to handover to QoMEX 2014 which will be held in Singapore and chaired by Stefan Winkler. Further information about QoMEX 2013 can be obtained from http://www.qomex2013.org/. Please find below feedback from participants. QoMEX 2013 provided a small, focused workshop on quality of multimedia experience. Excellent facilities and amazing summer weather created a relaxed environment for a range of conversations with colleagues. While there were many interesting papers, for me the plenary sessions were particularly notable – from Kansei Engineering of products to the details of 3D video and image processing, QoMEX 2013 embraced the true breadth of Quality of Experience. Overall, QoMEX 2013 again demonstrated that the small, focused workshop style environment creates a depth and quality that truly warrants international conference travel. I've had the pleasure of having an end-to-end view of QoMEX 2013, from the point of view of the organizers, as part of the organizing committee, as an author, and also as an attendee, in beautiful Klagenfurt am Wörthersee. The experience was truly excellent throughout. From the joint work with the organization committee and TPC members, the high-quality program we had this year, the perfect logistics in Klagenfurt, and swimming in the Wörthersee, the whole experience was indeed delightful. QoMEX has clearly developed into a stable platform for the exchange of knowledge in the area of Quality of Experience, with a focus on visual and multimodal experiences. The number of participants and of high-quality papers shows that it is of high relevance for the community. Intense workshop, fully crowded from the first session till the last one, endless days stimulated by discussion, QoMEX 2013 has been a big success confirming the strength and the growing value of our community. Special thanks should go to Christian Timmerer and the local organizing crew for the amazing conditions they offered: experiencing a «mise en abyme», a sensation of being experts exchanging on QoE while living at the same time many delicious experiences. Christian, as responsible author of the application section of the QUALINET white paper on definitions of QoE, surely had in mind and successfully managed to extend our vision on application domain for QoE. As a matter of fact QoE was not only a matter of talks and papers, but something everyone could touch on from many other sources and media during these three days! QoMEX is about QoE & multimedia …well we have a QUALINET definition for QoE, revisiting definition of multimedia could be also considered. QoMEX 2013 was a true quality event - not only because one could learn a lot about the subject of QoE, but also because one could experience quality in many different aspects of the workshop: the perfect organization, the technical sessions and plenary talks, the inspiring ambiance of the Seepark Hotel as well as the enjoyment of some of the best local food and drink specialities. In this respect, one of my personal highlights was the boat trip across the lake Wörthersee, which in combination with the sunset and the dinner reception at "Werzer's Badehaus" enabled a truly memorable "Quality of the Lake Experience". In a sense, I there was something missing in QoMEX’13. It was so filled with exciting scientific contributions and inspiring talks, so full of opportunities to interact with researchers and industrial partners, both during the poster/IF-demo-expo sessions and the delicious lunches, so well organized also in terms of memorable social events, that I missed the time to make use of the SPA facilities of the wonderful hotel where QoMEX’13 was hosted! 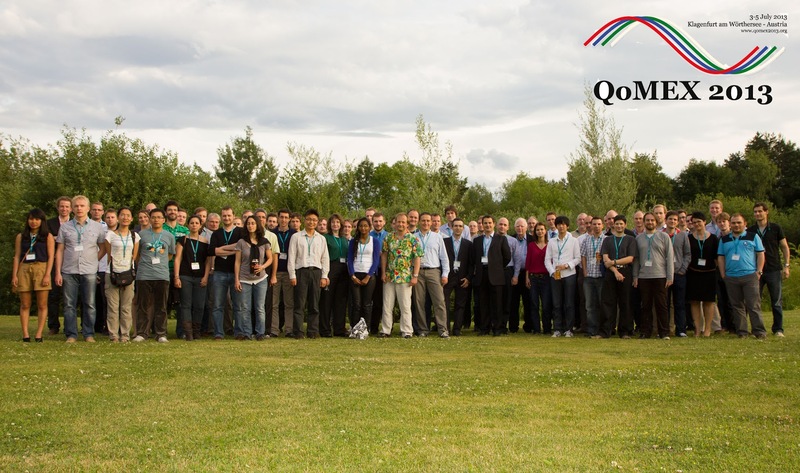 I luckily had the chance to visit QoMEX'13 in Klagenfurt this year, and can say that it was really a great experience. It was a focused and dedicated forum where researchers came together to exchange research results, discus, inspire each other, and, last but not least, socialize. Everything was excellently choreographed by Christian Timmerer and his great team. As such, it was a truly community building event, which I expect to last and grow. I personally look back warmly to 2 awesome days in Klagenfurt and am looking forward to participating in QoMEX also in the future. I thoroughly enjoyed QoMEX 2013, as it offered something for all senses: inspiring presentations, stimulating discussions, and excellent Austrian food, all in a beautiful location with great weather. The QoMEX steering committee also assigned the task of hosting next year's edition of the workshop to our organizing committee. It will be held September 18-20, 2014 in Singapore. We are already hard at work putting together an event and experience that will hopefully be as exciting and memorable as this year's. I look forward to welcoming you in Singapore for QoMEX 2014! The technical program is focused on the quality issues, however, manages to span a broad field of methods and application areas. The program attracts the larger community in the multidisciplinary aspect og multimedia technology. The conference was at a lovely venue and the single track feature gives rise to a lot of discussions amongst peers and provides a valuable arena both for fresh and the experienced researcher. The setting of attempting to keep the participants together for meals and evening activities strengthens the dialog and sense of community building. As an invited keynote speaker I have my expertise in the area of affective engineering. Despite that I felt that I was warmly welcome by the QoMEX community and we found many common points of interest. this is very informative article i really like it very much,i get really very much information from it thanks for the nice posting .